Om ! Speech is rooted in my thought (mind) and my thought is rooted in my speech. Be manifest, patent, to me; be ye two, for me, the lynch-pins of the Veda. Let not Vedic lore desert me. With this mastered lore, I join day with night. I shall speak what is right; I shall speak what is true. Let that protect me; let that protect the speaker. Let that protect me. Let that protect the speaker, protect the speaker ! Om ! Peace ! Peace ! Peace ! 4. 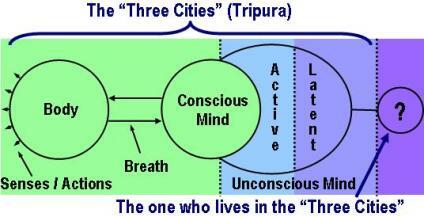 Pervading the three cities [tripura], the three bodies, illuminating within and without, She, the Consciousness within, becomes the Maha-Tripura-Sundari, being associated with space, time and objects. 6. The fivefold form relinquished And effects like space transcended, Remains the one, the great being, The supreme Ground, the only Truth. 9. The songs of praise dwell in the highest sphere Where dwell all gods; With Ric what will he do who knows not this ? They who know this well, they dwell all right; This is the secret science.